Perennial Singapore Investment Holdings Pte Ltd holds a 72.2% stake in Perennial UW Pte Ltd, which holds a 45% stake in Yanlord Perennial Investment (Singapore) Pte Ltd ("YPIS"), which in turn holds a 34.4% stake in United Engineers Limited ("United Engineers"), which therefore translates to an effective stake of 11.2% in United Engineers. In the year, YPIS had acquired an additional 19.9% stake in WBL Corporation Limited, which resulted in its effective stake increasing from 10% to 29.9%. Perennial SL Pte Ltd holds a 66.7% stake in Sanctuary City Pte Ltd, which holds a 60% stake in the development in Indonesia. The effective ownership is therefore 40%. 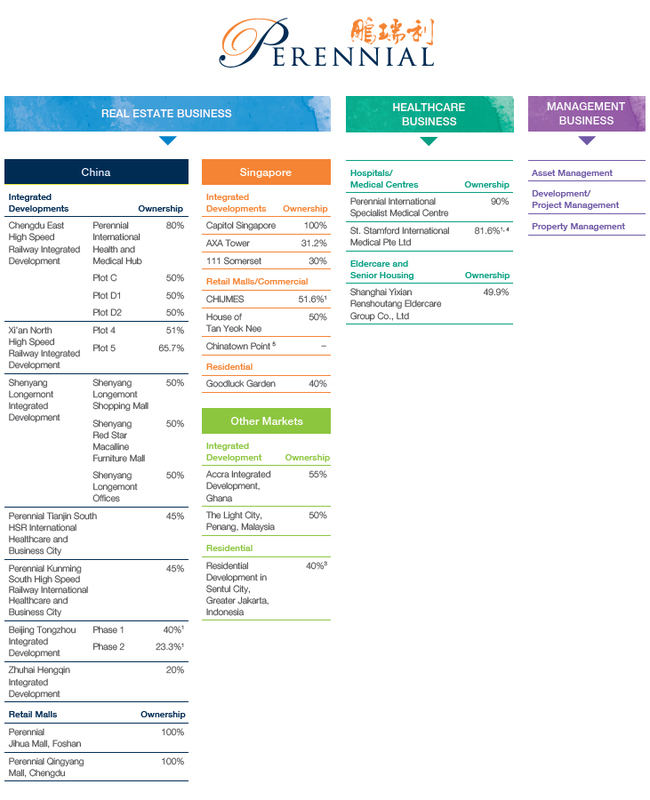 St. Stamford International Medical Pte Ltd owns a 49% stake in each of St. Stamford Modern Hospital, Guangzhou, and St. Stamford Plastic Surgery and Aesthetic Hospital, Chengdu, which translates to an effective stake of 40% in each of these hospitals.